I was going through our pictures on our computer, and I came across several doosies that have inspired me to start a semiregular themed post called, very creatively, From the Archive. I'm actually thinking I'll do one every few Saturdays, but I was totally inspired, so I'm starting tonight. And in all fairness, I have chosen myself as the first subject. Some of you might know what this rather loud getup and leprechaunish shoes signify, but for those of you who don't, I must confess. 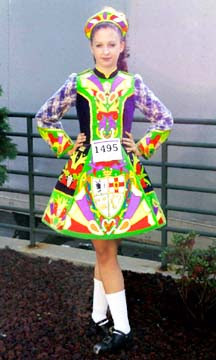 For several years, through my junior year of high school, I was a competitive Irish dancer. Many of you mightn't have a clue that such a thing existed, but that's probably because you've never lived in Ireland, Chicago, or New York, or even Cleveland. Trust me, it's very big. I have another confession. For the majority of the time I danced, I was a member of the school where Michael Flatley began. You know, the most flamboyant heterosexual known to mankind (aka The Lord of the Dance). If you're wondering what happened to my long, curly hair as seen in this photo, I'm not really sure. It's probably in a tote bag under my grandmother's bathroom sink. Now that I have you sufficiently confused, and probably more than a bit frightened of my elderly grandmother, I should probably explain: It was a wig. After writing that, I realize that most of you are no less frightened than when you thought my Nanny was keeping decades-old hair clippings in a bag. But the wig is a very big thing in Irish dance. 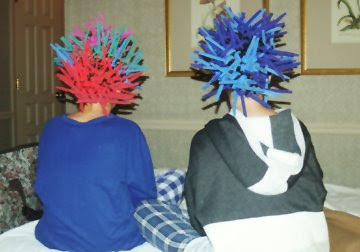 Because before the curly wig came along, we would have to suffer through public humiliation wearing the dreaded spikes. This photo was taken of me and Tricia in Pittsburgh. After we'd flown there from Chicago WITH THESE THINGS ON OUR HEADS. (Tricia was one of my bridesmaids. I mean, if you go through this with somebody and live to talk about it, you've earned your place in each other's wedding parties.) They even made t-shirts for you to wear that stated, rather sassily, They're SPIKES, so that the inevitable gawkers would have at least one basic question answered. The t-shirts did nothing, though, to answer questions like, Why exactly are you wearing weird multicolored pointy sponges on your head and tippity tapping around this IHOP? or Where has all your natural teenage embarrassment and self-consciousness gone? I'll answer those questions right now. My passion for winning rivals that of Monica Geller. When it comes to competition, I am mercilessly and unabashedly out for blood. You might not be able to take me seriously when I say that, especially when referencing the ridiculous photos above, but it's true. And just so you know, that look on my face up in the first photo? Yeah, that's smugness. Because I won a lot of medals. The medals you see here were won at a competition in Windsor, Canada, and I was the Scary Girl for the day. That is, the girl who you didn't want to have to dance with (you danced two at a time for the judges) because you knew she was really good and was winning a lot. Little did I know at the time, that would be my last feis. So, after hanging up the ole dance shoes, I have had to find other ways to release my fierce competitive aggression. Which is why Noah and I don't play tennis together very often. The last time we did, I smashed winners when we were warming up and said mean things along the lines of "you're hitting like a little girl." Hopefully you've learned a little something about me. And can forgive me if I've ever offended you by going to extremes to beat you at something. As you can see, I really just can't help it. AWESOME! You are cooler than I previously suspected! I was totally in danceline in high school and had to wear a sequined 'bun cover.' Except my hair was too short so I had to stuff my with cotton balls. I am literally laughing out loud. The best part is, we did these things without irony. Oh Erin! Look at you. Too much. I'm glad you were a winner. I always knew that of course. Maybe you should try running again? erin really is competitive when it comes to sports. to bad she's not very good at them and i can beat her at almost anything we do. at least you have medals that look like your michael phelps. Ah, this post made me so happy! I just spectated at a feis this weekend and was unspeakably nostalgic...so nice to see another mad wighead on the blogsophere! Awwww, the first picture is adorable. I'm a little slow on the up-take this morning, though: what exactly is the point of the spikes? Are they very, very strange hair curlers?